The use of too many communication channels can actually hinder collaboration. That's why many organizations are now moving toward a single interface for all business communications. 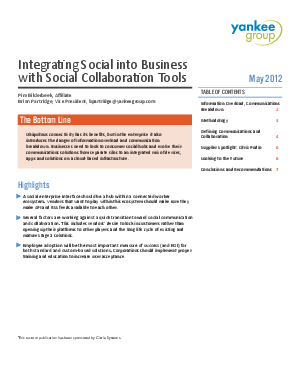 Enterprises realize they must improve the communication and collaboration experience but are still figuring out how social media integrates within corporate culture and business process. This Yankee Group white paper explores how built-for-business social workspaces enable employees to more effectively work together and move projects to completion faster.